It was party time at Avenue Road last weekend as Finedon Dolben returned to the top of the tree in local cricket after a seven-year wait. Ultimately, the weather ensured Dolben were crowned Hevey Building Supplies Northamptonshire League Premier Division champions for the first time since 2011. 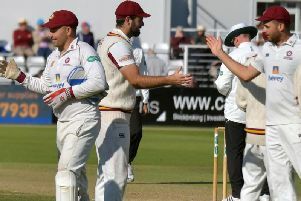 But they did win it on their own terms, reaching 150 and more in their innings to secure the two points they needed to wrap up a memorable season. Captain Callum Berrill was at the crease when the first and only target was reached as he made an unbeaten 47 while Drew Brierley (51) and Tom Sole (24no) helped get Dolben to 171-4 in 31 overs before the weather put paid to the remainder of the final-day clash with Brigstock. An early finish simply meant more time to celebrate and Berrill was deliver the crown for “a unique club”. 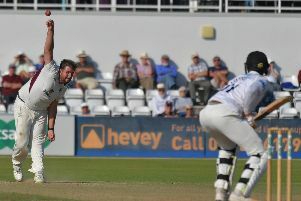 “The guys have been fantastic, they fully deserve their success and each member of the squad has earned the right to call themselves a Premier Division champion,” the skipper said. “We have kept things simple, done the basics well and pulled together when things have gone against us. “Finedon Dolben is a unique club. The town is so supportive and there are so many volunteers that give up their time to run the club, ground and juniors. “To be able to bring the trophy back to such a special place means a huge amount to all the people involved and the wider community. “There was a real sense of anticipation on the weekend, having heard that our league rivals were batting and to lose the toss and be batting ourselves, we knew the trophy was not yet ours! “Once we settled into our innings and the persistent drizzle took any remaining life out of the ball, we reached the 150 milestone and celebrated with a mixture of relief and joy! Once the dust settles, attention will turn to the defence of the title next year. And Berrill hopes it will simply be a case of more of the same. “I am not sure that this year has fully sunk in yet, but we will look to continue the processes we started this season,” he added. “We are amateurs and will look to play enjoyable and entertaining cricket next year. It’s been another excellent season of action in the Hevey Building Supplies Northamptonshire Cricket League. And, as the campaign draws to its conclusion, we round up all the ups and downs. Relegated: Wellingborough Indians 2nd, Earls Barton 2nd. Promoted: S&L Corby 2nd, Loddington & Mawsley 2nd. Promoted: Mears Ashby, Hardingstone, Old Northamptonians 4th. Promoted: Weldon 2nd, Little Harrowden,. St Crispin & Ryelands 3rd. Promoted: Brigstock 2nd, Kislingbury 2nd, Kettering 3rd. Promoted: Bold Dragoon 2nd, Stony Stratford 4th, Burton Latimer 3rd. Promoted: Obelisk Kingsthorpe 2nd, Barby 3rd, Grange Park. Champions: Northampton Saints Grendon 4th. Promoted: Kettering 4th, Geddington 4th, West Haddon & Guilsborough 2nd.